Regulated by MGA and UK Gambling Commission, Spinit is a trusted, reliable and eCOGRA-audited online casino that is perfectly compatible with mobile devices and provides a thrilling gambling experience, with over 1200 games offered to both desktop and mobile users. Australian players and users of other countries will find it very easy to make transactions to the casino, since the minimum deposit is just $10. The casino is played directly in a browser without having to install any apps whatever. Players of Australia are allowed to transfer AU$ to their personal real-money balance at the casino; however, the AUD amount will be automatically exchanged into a relevant Euro or USD amount, at the player’s discretion. The banking options are standard for Australian players and include VISA, MasterCard and a few other secure and reliable options. The financial provisions in the casino T&C are clear and unambiguous, without fine print and unpleasant surprises. The max deposit amount is $5000 per transaction, while the max amount you may request to withdraw is $5500 a week. After you have registered an account and deposited $20 or greater, you are entitled to claim the 100% first deposit bonus, up to $200, which needs to be wagered x40 times within 14 days since you claimed the bonus. After that, you may claim the second, third and fourth deposit bonuses, which are all part of the welcome package. Australian players are also welcome to make use of any or all bonuses. In addition, a new player receives 20 free spins on Starburst for ten days in a row. As of writing this review, Spinit has offered two regular reload bonuses. Every Monday, you may open your Cashier page, make a deposit and claim the 25% reload bonus up to $100. Similarly, on Wednesdays the casino offers a reload bonus plus free spins on the pokie of the week. There are also casual promotions that run for a limited time span and involve playing pokies. Some of these bonuses take the form of tournaments or raffles with a huge prize pool. The casino personally invites loyal users who deposit and play much to enter the VIP Club that provides lots of benefits and possibilities to its members, including (but not limited to) birthday bonuses, cashback bonuses, exclusive gifts and a monthly prize draw. The assortment of amazing games at Spinit will certainly impress you as soon as you register and start browsing the Games page. They present 1200+ creations from Microgaming, NetEnt, Play’n’Go, NYX and other topnotch software vendors. The games are grouped into the following categories: Video Pokies, Classic Pokies, Jackpot Games, Live Games, Table Games, Video Poker and Scratch Cards. 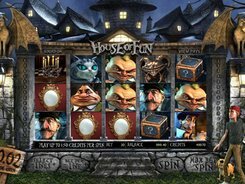 To find a specific game, you may enter its title in the search line on the Games page of the casino. 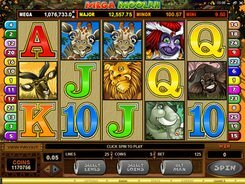 Progressive pokies are not widely represented, with about 15 of them published at Spinit, such as Mega Moolah, LotsaLoot and Cash Splash, all requiring registration before spinning them and winning.